Ho Hum.. here we go again! Well, nothing too unusal tonight. Yes, two different meals, but the big deal is that I used ALOT of my produce. I used the rest of last week’s potatoes, the new purple potatoes, a whole head of Matt’s garlic, the two green peppers that I got in my box, all of the green beans and half of the cherry tomatoes. Bob and I both have lunch leftover for tomorrow and the grands had quiche for dinner tonight. So, I think that was a productive food day. 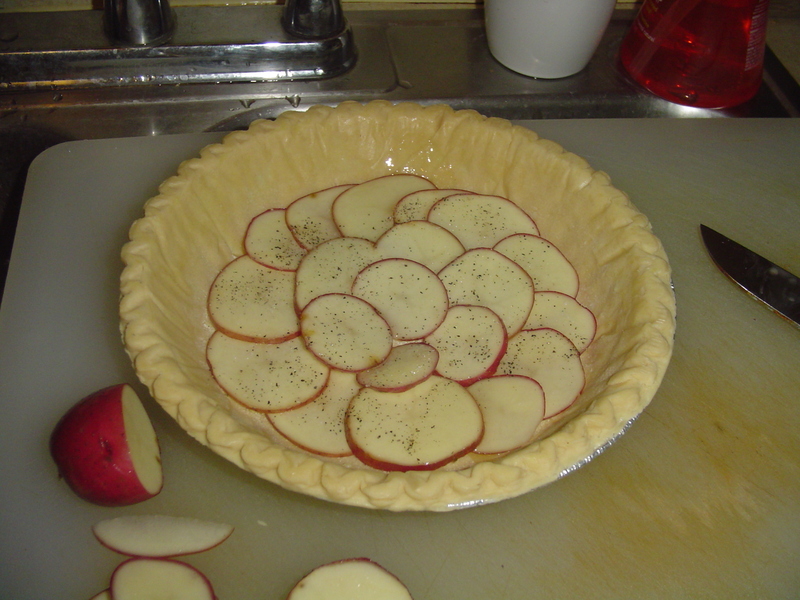 I liked the quiche with the potatoes on the bottom (of the store bought pie crust). Quiche: Just eggs, (8) 3/4 c milk,1/2 c any kind of cheese ( I had parm). 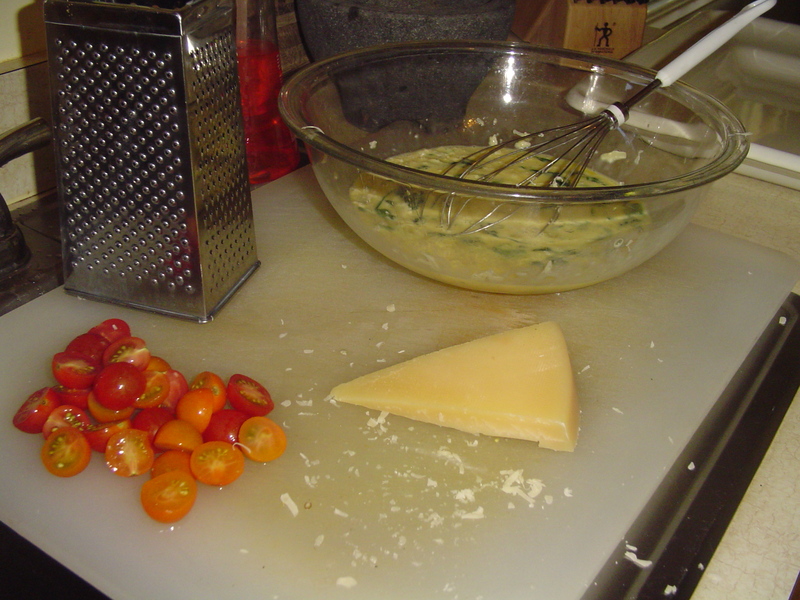 I used fresh spinach (that I sauteed ) ,green peppers, garlic and the cherry tomatoes halved. Dumped everything into the pie crust ,over the potatoes, except the tomatoes which I placed carefully on top of the mixture, cut side down. It did take quite a while to cook. Probably one hour at 375. I put foil around the crust so it did not burn. I sauteed the beans in olive oil & garlic and then added the rest of the cherry tomatoes at the end and some balsamic vinegar. 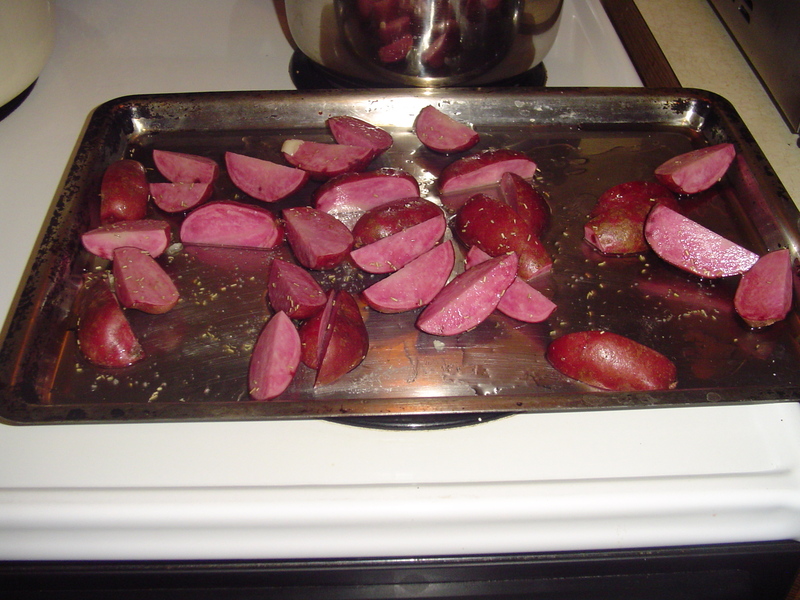 I roasted the purple potatoes with olive oil, garlic, dried rosemary S & P for 45 min at 375. 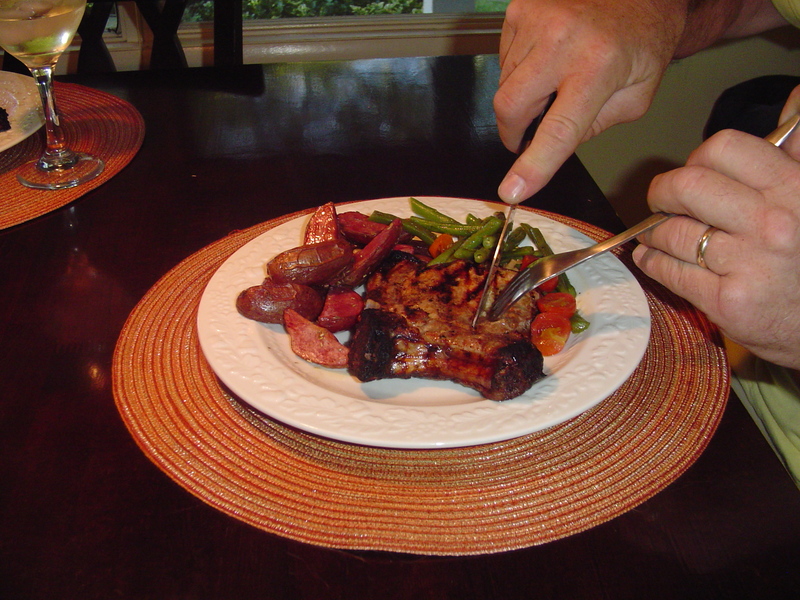 Oh, yes ,of course there was the meat entree, a grilled pork chop from Duma’s. I marinated that in a hodge podge of stuff from the fridge. Lemons, fresh oregano, garlic, a hot pepper from Matt, olive oil & balsamic vinegar. I think that was it. Bob was happy with it! And, I am with you Tom, my hands smell like garlic most of the time. I wish it was basil, that would be a lot better! This entry was posted in Dinner, Lunch on August 16, 2011 by andrewsbeth. 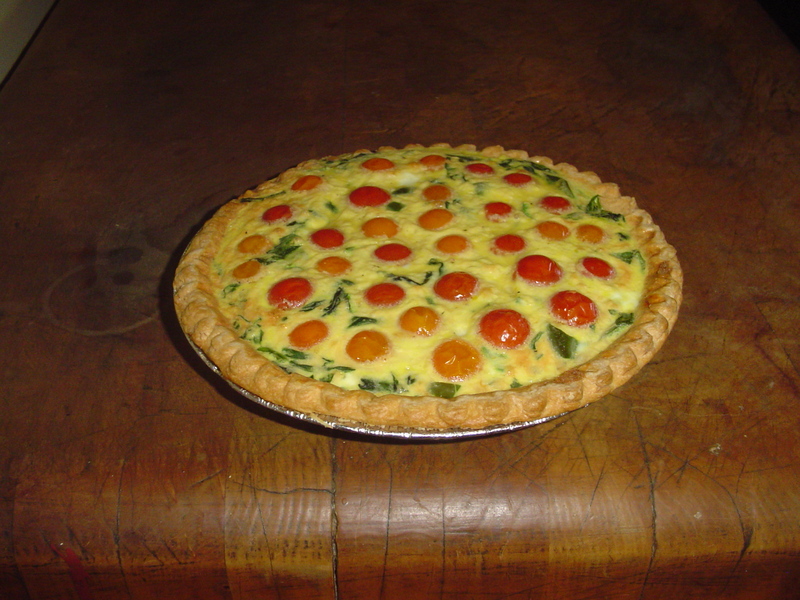 I am making that quiche tonight for dinner! That looks great! Thanks Laura, do you and Dave eat quiche? Such beautiful food, and I’m sure delicious as well – so why on earth is the title “Ho Hum”?!? This post is anything but ho-hum. I wish my significant other would eat quiche. Maybe I can make a mini one in a tartlet pan sometime. I’ll eat anything you make……..except for mussels, or fish, or pickles haha. I thought , ho hum because I posted the same kind of food before. Don’t want to bore you all! Just go next door tomorrow, Tom. Carolyn said she was making this quiche tonight. Maybe there is an EXTRA piece hanging around! Carolyn are you reading this? Give Tom a piece of quiche! Sorry Jeff, looks like cereal for you. Ohhhhhh I love this blog! I’m rolling on the floor.